As Canadians, we like to believe we’re forward-thinking, peaceful, and world-leaders in rights issues. For the most part, we are–at least for human beings. Unfortunately, we don’t afford our animal counterparts some of the most fundamental rights we enjoy. In fact, Canada’s animal protection legislation has not been overhauled since 1892, and our animal rights rank below some third-world countries. It’s a hard fact to wrap your head around, but it’s true. That’s not to say Canadians don’t care. We do. When surveyed by Environics Research, 92% of Canadians support “updating the criminal code to make it easier to convict on acts of cruelty to animals.” So, why haven’t our laws caught up to our moral compass? Some people, like Co-owner of Master Mechanic High Park, Josie Candito, have been working with government officials for years to incite change. In their response, the government also said, “Animal cruelty laws should be balanced and protect animals from deliberate and unnecessary acts of cruelty while not interfering with legitimate animal use, including Indigenous animal harvesting rights.” While the Government believes that animal cruelty is an important social issue that deserves a national conversation, many animals are harmed each day we remain silent. In Arif’s response, he outlined his commitment towards finding a comprehensive solution. He also voiced his interest in having his constituents directly involved in the conversation in Ottawa–something Josie plans to do. Our current animal cruelty laws only protect animals from unnecessary suffering or distress but do not protect their lives. If this makes you feel sick, you’re certainly not alone. Most of us would never harm or kill an animal. Most of us view our pets as members of our family–but laws typically exist for outliers, not the average person. Anyone who has had the fortune of living with a pet understands that they possess emotions and unique personalities. They also know that they share much more in common with us than a TV. It’s time our laws reflect that. This may not be easy for legislators, but it’s long overdue. 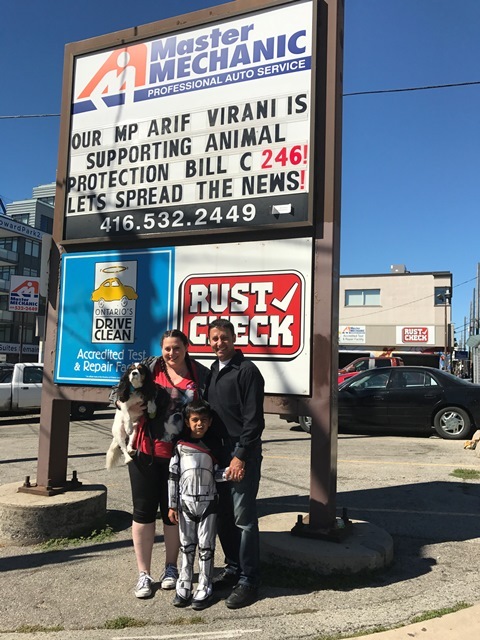 In Parkdale-High-Park, we’re lucky to have forward-thinking representation, like Arif Virani, that believes in protecting our animals. In some areas, getting leadership onboard is an uphill battle. We’d like to take a moment to thank Arif for his support and for acting as a voice for our wonderful community. As we take the fight for our furry friends to parliament, we have no plans of slowing down. 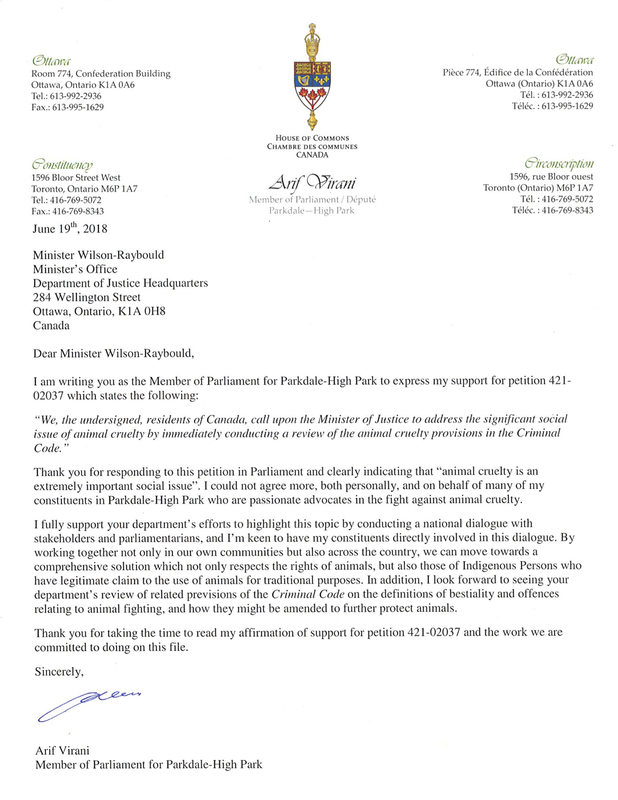 Take a moment to read Arif’s response below and research the current state of our animal protection laws. If this is something you feel strongly about, show your support by getting in contact with your local Member of Parliament. Let them know these issues matter to you, and that it’s time for our laws to catch up to our moral compass. < Enter Our Monthly #MasterChallenge Contest!